Authors: Malhan Sachit, Agarwal Shekhar, Srivastav Shekhar, Singh Harjoban. Orthopedics Consultant , Malhan Polyclinic, Wz,g-4, Milap nagar road, Uttam nagar, New Delhi, India. Department of Trauma and Orthopedics (DITO), Sant Parmanand Hospital, New Delhi. India. Department of Orthopedics FELLOWSHIPS (formerly), University of Aberdeen, Scotland, UK. Introduction: Late diagnoses of orthopedic injuries after epileptic crisis are a matter of concern. The rarity of correlation between seizure and specific trauma incidences such as bilateral anterior shoulder dislocation, may lead to improper estimation of the patient’s clinical state, wrong treatment and unpleasant complications. Case Report: We report a rare case of bilateral anterior shoulder dislocation associated with coracoid processes fracture after a seizure episode, in a young lady of 29 years. This is a rare event, however as patient is often disoriented after seizures, frequently this can be missed diagnosis. So this article puts emphasis on possibilities of rare diagnosis, which if treated promptly can lead to early restoration of complete movement. Conclusion: Although it is not a common problem, but one should have a high degree of suspicion and should always opt for further radiological examination if there is any doubt. Keywords: Bilateral, anterior, dislocation, seizures, Hill Sach’s. Late diagnoses of orthopedic injuries after epileptic crisis are a matter of concern. The rarity of correlation between seizure and specific trauma incidences such as bilateral anterior shoulder dislocation, may lead to improper estimation of the patient’s clinical state, wrong treatment and unpleasant complications. We report a rare case of bilateral anterior shoulder dislocation associated with coracoid processes fracture after a seizure episode, in a young lady of 29 years. This is a rare event, however as patient is often disoriented after seizures, frequently this can be missed diagnosis. So this article puts emphasis on possibilities of rare diagnosis, which if treated promptly can lead to early restoration of complete movement. Up to best of our knowledge and review of literature, this is a rare case, accounting for three other similar cases reported [1,2,3], with only one case with bilateral coracoid process fracture . The difficulties of the diagnosis as well as the treatment are been described. A possible explanation for the mechanism of the injury is stated. A 29-year-old young lady, with no previous history of convulsion or comorbidities, presented to emergency department at night, with history of first time seizures, while she was in bed, with severe pain in both the shoulders. On examination arms were abducted and externally rotated. Bilateral shoulder movements were painful and restricted. There was loss of round contour of shoulder. Neurological status was intact. Radiological examination revealed bilateral anterior dislocation of the shoulders without any associated fractures (fig 1). She was hypoglycemic and hypovolemic so was given immediate medical management in ICU. Because of her condition, intra articular anesthesia with Xylocaine 2% was used. Reduction was done by Kocher’s maneuver. Post reduction splintage was done on both the sides with arm immobilizer, with no post reduction neurological deficit. After patient was stabilized medically, she was taken for MRI Brain/ EEG and NCCT of both shoulders. MRI Brain and EEG were normal, However CT reported Bilateral Hill Sach’s lesion, with fracture of coracoid process on right side. Both the arms were mobilized second day onwards with protected splintage to be continued for two weeks for left side, and 4 weeks for right side. 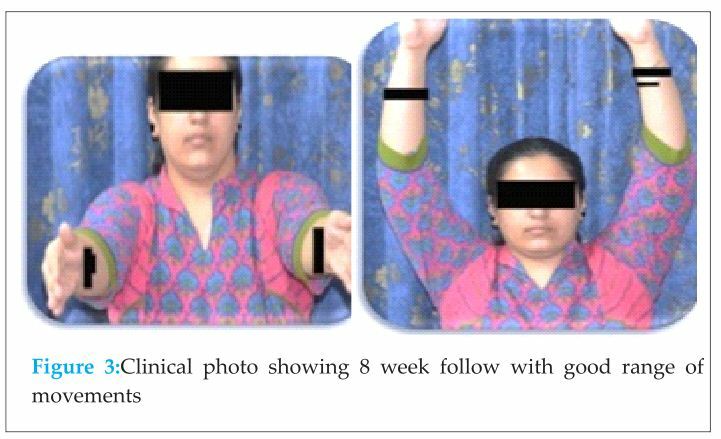 Patient regained her complete movement by eight weeks. No further episodes of instability ensued in further follow up care (fig 2). Unilateral shoulder dislocation is the most common concerning 85% of all dislocations. Ninety-five per cent of all dislocations are anterior and 15% of them are combined with greater tuberosity fractures . The most common bilateral shoulder dislocation is posterior resulting from seizure or convulsion due to epilepsy, electric shock or other reasons [1,2]. 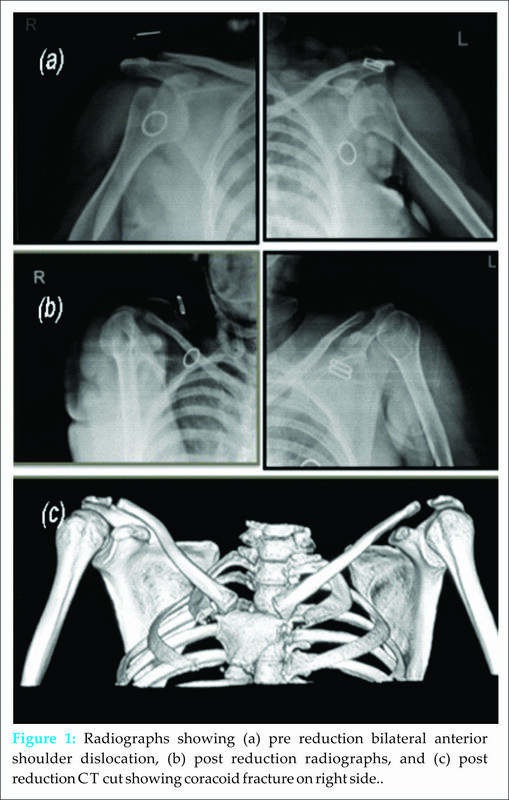 Simultaneous bilateral anterior shoulder dislocation is usually of traumatic origin and occurs rarely [4,5]. Seizure has been charged in the past for bilateral anterior shoulder fracture-dislocation [1,6,7]. Anterior shoulder dislocations, unlike posterior, happen, almost always, secondary to trauma and very rarely due to seizures. Posterior shoulder dislocations usually occur following unbalanced muscle contractions (electric shock, epileptic seizure etc.) [5,8]. The reason why the shoulder dislocates anteriorly after trauma is that as the arm extends and abducts, impingement of the greater tuberosity on the acromion levers the humeral head out of the glenoid . Moreover the rotator cuff pushes downwards the humeral head, which is finally displaced anteriorly by the flexors and external rotators. The posterior dislocations are more common after seizure since the contraction of the relatively weak external rotators and the more powerful internal rotator overcomes the posterior fibers of the deltoid. The succeeding adduction and internal rotation usually causes the humeral head to dislocate posteriorly . This combination of findings is rare, especially by the presence of associated coracoid processes fracture on one side (right). Possible mechanisms related are direct trauma of humeral heads over the coracoid processes or sudden pull of biceps short head attachment site during uncontrolled contractions . The literature suggests that over 15% of documented bilateral anterior shoulder dislocations following trauma were diagnosed late. As there is a greater awareness of anterior shoulder dislocations for trauma patients, it would be reasonable to assume that there may be a higher incidence of delayed diagnosis of such an injury following a presentation with an indirect complaint, such as a seizure. The unusual presentation combined with the patient’s post-ictal discomfort and drowsy state may potentially delay the diagnosis. As this could affect the prognosis, early recognition is emphasized. Up to best of our knowledge and review of literature, this is a rare case, accounting for three other similar cases reported, with only one case with bilateral coracoid process fracture . The difficulties of the diagnosis as well as the treatment are been described. A possible explanation for the mechanism of the injury is stated. Bilateral anterior shoulder dislocations is rare entity, associated usually with trauma (>50%), seizures (30%) [ , and frequently missed in post seizure patient, specially in post-ictal phase of recovery from seizure so not knowing of this entity results in missed diagnosis (15%) . These types of dislocations are due to unique mechanism of injury. When diagnosed and treated promptly lead to restoration of completely normal shoulder joints. Acute spontaneous atraumatic bilateral anterior dislocation of the shoulder joint is not uncommon problem, so a high degree of suspicion should be kept in mind while treating a patient in post-ictal phase, as, if treated promptly, leads to complete functional recovery. Nevertheless, further radiological evaluation must always be sought, to rule out pre-existing pathology for further treatment planning or patient education purpose(s). 1. Devalia KL, Peter VK: Bilateral post traumatic anterior shoulder dislocation.J Postgrad Med 2005, 51(1):72-73. 2. Cave EF, Burke JF, Boyd JF Trauma Management: Year Book Medical Publishers. Chicago; 1974:437. 3. 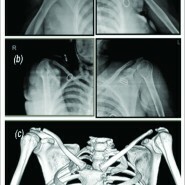 Honner R: Bilateral posterior dislocation of the shoulder. Aust N Z J Surg 1969, 38(3):269-272. 4. Peiro A, Ferrandis R, Correa F: Bilateral erect dislocation of the shoulders. Injury 1975, 6(4):294-295. 5. Dinopoulos HT, Giannoudis PV, Smith RM, et al. : Bilateral anterior shoulder fracture-dislocation. A case report and a review of the literature. Int Orthop 1999, 23(2):128-130. 6. Segal D, Yablon IG, Lynch JJ, et al. : Acute bilateral anterior dislocation of the shoulders. Clin Orthop Relat Res 1979, (140):21-22. 7. Markel DC, Blasier RB: Bilateral anterior dislocation of the shoulders with greater tuberosity fractures. Orthopedics 1994, 17(10):945-949. 8. 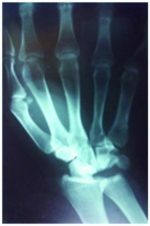 Connor-Read L, Bloch B, Brownlow H: A missed orthopaedic injury following a seizure: a case report. J Med Case Reports 2007, 10(1):20. 9. Neer CS: Displaced proximal humeral fractures. J Bone Joint Surg [Am] 1970, 2:1077-1089. 10. Solomon L, Warwick D, Nayagam S: Injuries of the shoulder, upper arm and elbow. In Apleys System of Orthopaedics and Fractures. Edited by Solomon L, Warwick D, Nayagam S. London: Arnold; 2001:587-589. 11. Manoharan G, Singh R, Ahmed B, Kathuria V: Acute spontaneous atraumatic bilateral anterior dislocation of the shoulder joint with Hill-Sachs lesions: first reported case and review of literature. BMJ Case Rep. 2014 Jun 3;2014. pii: bcr2013202847. 12.Rafael et al : Bilateral Anterior Dislocation of the Shoulder: Review of Seventy Cases and Proposal of a New Etiological-mechanical Classification Journal of Emergency Medicine 2013, 44(1):269–279. 13. Taneja AK, Pecci Neto L, Skaf A. Bilateral anterior glenohumeral dislocation and coracoid processes fracture after seizure: acute MRI findings of this rare association. Clin Imaging. 2013 Nov-Dec;37(6):1131-4.